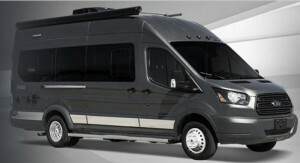 You are absolutely going to love the ride of the Paseo 48P class B motorhome from Winnebago. This 2017 model is one of the best van campers on the market, and it shows with the optimized floorplans and spacious feels. Well, at Bullyan RV, we are proud to carry the Paseo 48P class B at a very reasonable price, but there is one catch — there is only one model left for this model year going at the extraordinary price of $92,995; almost $30,000 off the MSRP! This Paseo 48P floorplan for sale speaks for itself at this low price and with the features that come along with it, but if you need a little more convincing, we’ve put together our top 4 favorite features of this wonderful model to show you why it is more than worth this extremely low price! Check out how compact the Winnebago Paseo Class B is. Most class B camper vans have this feature to provide additional seating in the camper when you reach your destination. However, the Winnebago Paseo Class B Motorhome also features pull-out tables so that you can also use this space for doing work, having dinner, or just for somewhere extra to put something. An external hose, a full-power awning, additional storage; all of this and more comes complete with the Paseo 48P; and that’s just on the outside. This camper makes sure that you have everything that you need both inside and out. Plenty of space in the Winnebago Paseo Class B Dining area. With a dinette space that can seat up to six people, complete with a nearby television, the Paseo has enough space for you and your friends to relax and enjoy dinner with room to spare. Then, when you are ready to hit the hay, you can convert it into an extremely comfortable sleeping area. Something you never want to miss out on is cooking a great meal. With some class Bs, this is difficult, but the Paseo makes it a breeze to cook your favorite dishes in style with its spacious kitchen and ample storage space both in the kitchen and throughout the RV. There is a lot to get excited about with the Paseo class B camper van for sale, but the one thing that is the most exciting is this price! Don’t hesitate to come by and check this thing out for yourself, because there is only one left at this price! If you want to snag this beautiful model up before someone else does, contact us today!